These studio portraits, gathered from various sources by collector Robert E. Jackson, feature one of the most popular props in early 20th-century informal portraiture: the paper moon. Jackson, who has assembled more than 12,000 pieces of vernacular photo ephemera over two decades, often discovers recurring pattens and motifs among the images, from comical photo-manipulated decapitations to proud displays of vinyl records. 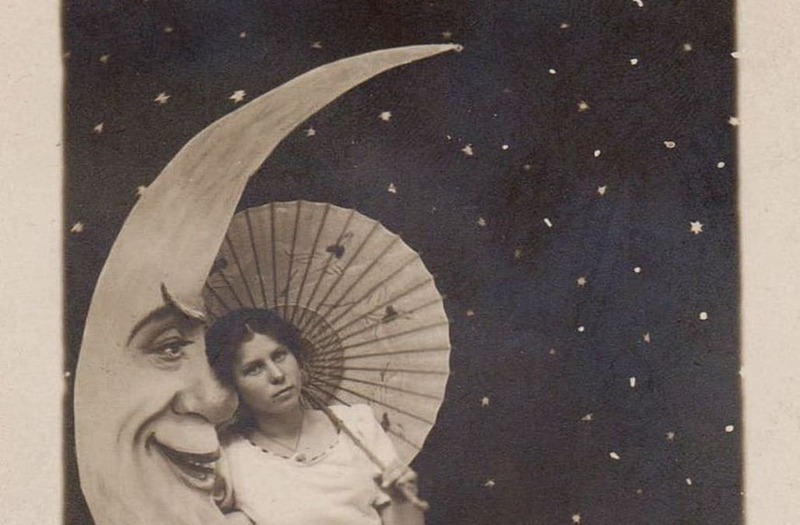 The paper moon was most commonly found in cheap photo studios at fairs and carnivals, offering couples and friends the chance to commemorate their festive time together with a souvenir postcard of their trip to the heavens.